I made some shelves for my shop a few months ago but never made a post about them. I figured I would go ahead and type up the steps in case somebody could find them useful. 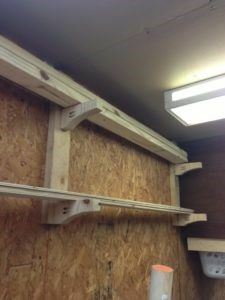 Basically I was sick of my 8 foot lumber just hanging around taking up floor space so I whittled up some super simple shelves that I could quickly throw up. 1) I grabbed some scrap 2x4s and cut three 2′ lengths. 2) Then I used a piece of 2×12 that I had left over from building my lumber rack and drew a random shape that I wanted the supports to be in, (just something slightly different than a rectangle sticking out of the wall) and used my jigsaw to cut it out. They measure 7 1/4″. 3) I used that first one as a template and just traced it out on my remaining material then cut however many more I needed. 4) Next I used my Kreg Pocket Jig to attach the supports to the 2x4s then found the studs along my wall and screwed the assembly into the wall using 3″ screws. I repeated the same steps and made a second rack for 6′ items and put it on another unused wall. Since this was was shorter I only made one row of supports.